Fred. Olsen Windcarrier’s jack-up vessel Bold Tern has arrived at the Hornsea Project One offshore wind farm in the UK ready to install the first turbines. According to the UK-based company, the vessel left the Alexandra Dock in Hull yesterday morning after picking up the first batch of Siemens Gamesa 7MW turbines. 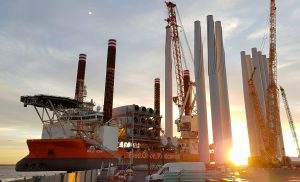 Bold Tern is in charge of transporting and installing half of the project’s 174 turbines, with the remainder set to be installed by A2SEA. Hornsea Project One also comprises three offshore substations and the world’s first Reactive Compensation Station (RCS) located some 120km off the Yorkshire coast. Once fully operational in 2020, the 1.2GW project will be the largest offshore wind farm in the world.